I have written out a simple savory version below, but you can add herbs and spices to make any flavor you fancy. You can even make it sweet by reducing the salt and adding some concentrated liquid sweetener and cinnamon or other spices and flavors. You can also replace any of the seeds with another variety such as hemp seed, poppy seed or some kind of chopped or ground nuts. These would make a lovely holiday gift if you wrap them in a nice box. Preheat the oven to 150 C / 300 F. Mix all the ingredients in a bowl and let them sit for about five minutes so the flax can form a gel. Cover one large or two smaller baking sheets with parchment paper. Spread out the seed batter over the parchment paper in a thin layer. Use a knife or pizza cutter to divide the batter into crackers. Bake the crackers for 25 minutes until they are firm. Take care that the edges do not burn. Turn off the oven, but leave the crackers in with the door closed for another hour or more so they can dry out completely. Store the crackers in an airtight container. They will keep for at least two weeks. I made these this morning as I wanted something low carb to spread margerine on. It was a bit of a hassle but they turned out quite nicely and crispy! Im having the worst sugar cravings today, so not only did I spread them with a thick layer margerine, I also made some keto proof ehmmm amandelspijs? almond mash ? haha, from almond meal, some melted margerin, almond extract and stevia. And then I ate 6 crackers like that(throughout the day). BTW I split the 'batter' in two and made the second batch savoury by adding some more salt and ground Italian herbs. Should be good too! For another day with other cravings. ;-) Im thinking a cheese kind of cracker, using miso and nutritionl yeast, would be tasty too! Sounds yummie! I think amandelspijs is called almond paste in English. :) Nutritional yeast is a really tasty addition to the crackers. Hello, you need to correct the temperature for us Americans. I think it should be 300 degrees F.
Hi Susan, you are right! Thanks for letting me know, I'll correct it right away. Martine, I made these today and they are wonderful. Since starting a low carb diet I was missing crackers. These hit the spot. Thanks for providing the recipe and all the great information on your website. That's great, glad you like 'em! I made these this morning but unfortunately they were far to salty for me. I might give it another go with no salt but untill then I'm sure the birds will enjoy them. The flax seeds are grounded or whole? 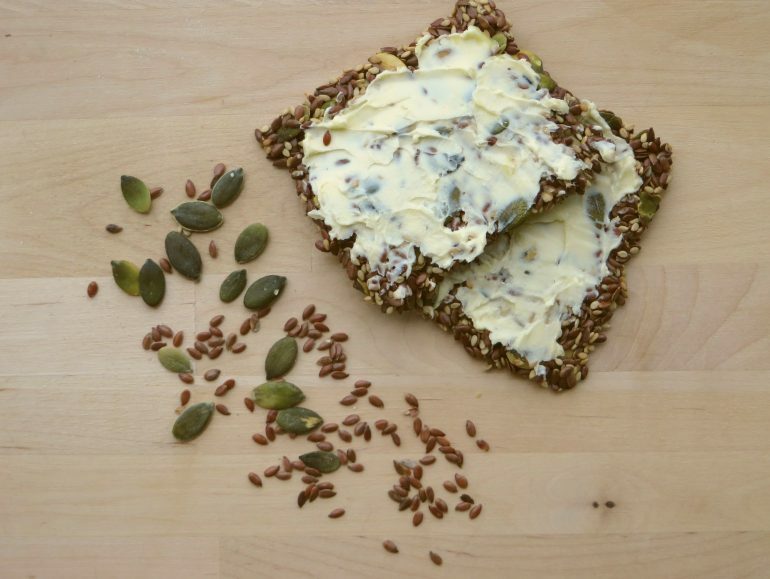 Hi Ana, the flax seeds are whole, but you could use part ground seeds to make a sturdier cracker. Hi Heidi, unfortunately I do not have time at the moment to convert my recipes to grams. However, you can look up conversion tables with google and figure it out that way. Sorry I can't be of more help right now. Hi, thanks for all the great recipes! I want to make these crackers today, do you have the nutritional info for them? Thank you so much! Hi Sara, I do not have the nutritional value for this recipe, but you can easily calculate it yourself with cronometer or a similar website. His many carbs per serving? And what is serving size?! So easy to make! I added some spices to make the crackers a bit more flavorful and a little ground flaxseed to make sure the crackers held together (perhaps an overabundance of caution, but I had never made crackers before and wanted to be sure they did not fall apart). Will be making again often! Thank you Jane! Glad it worked so well for you.